Ole Miss Rebelettes using our Glassless Mirrors on Rolling Stands! Our glassless mirrors are now being used by the Ole Miss Rebelettes! We were so excited that they wanted to have our glassless mirrors on rolling stands. They help with improving and perfecting their dancing and performing. They needed glassless mirrors on rolling stands specifically to move in and out of their practice area. Also, they have perfect reflection. Their Coach can move them about so easily because they are light! And…no fear of breaking. So, who are the Ole Miss Rebelettes? 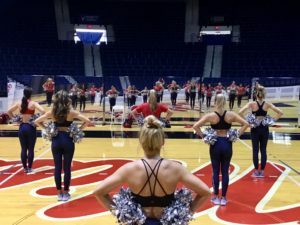 The Rebelettes are the official dance team at the University of Mississippi in Oxford, Mississippi. 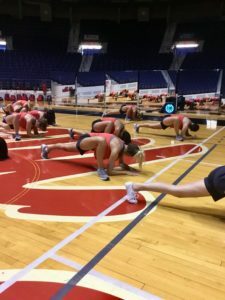 Meet the 2018/19 Rebelettes here http://spirit.olemissrebels.com/meet-the-rebelettes/. The Rebelettes are proud to be a part of Ole Miss Athletics and the Pride of the South Marching Band. You can find them cheering and dancing on the field/floor at football games, volleyball games and men’s and women’s basketball games. They also attend UDA’s college national’s dance team championship in January each year. Supported by these two departments, the Rebelettes bring enthusiasm, entertainment, and spirit to game day. The Rebelettes also serve as ambassadors for Athletics and the University through appearances, fan interaction, and community service. A perfect reflection to see their routine! Here’s what RACHEL LEVETZOW, Rebelette Coach/Coordinator says about our glassless mirrors! “Our coach has incredibly high expectations for our team and really pushes us to be our best every day, and with these mirrors, we are able to see ourselves and how we are improving with each detail and correction. We have truly enjoyed having our mirrors at every practice; there really is nothing better than not only seeing yourself improve but watching your team grow as a whole every day! Be sure to contact us if you have a similar glassless mirror requirement! Great news! Still time to order our PortaBarre as a gift for the holidays! Wondering what to buy the dancer in your family? We have the perfect present – EnPointe’s PortaBarre with carrying case. A portable ballet barre is a must for any dancer on the go! A great present for a daughter, son, or even for yourself! If they would love to practice more at home in their dance studio or any space your dancer uses then the PortaBarre is the perfect solution. 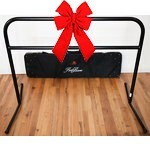 They would also be able to take the portable ballet barre to a friend’s house! Our PortaBarre – 4.5′ in gray. Wish they had a barre at Dance Recitals or competitions? Then our portable ballet barre with carrying case can easily be taken to these events. What is the PortaBarre you ask? It truly is a portable ballet barre that is available in either 4.5’, 9’, or 13’ lengths. The 4.5’ and 9’ both come with one custom-made, padded carrying case and the 13’ has two. The PortaBarre is lightweight but strong and stable and puts together in seconds with our spring-lock system. EnPointe’s portable ballet barre with carrying case is lightweight. The 4.5’ barre only weighs 15lbs and the 9’ with carrying case is only 25lbs. It doesn’t take up much room when not in use as the PortaBarre feet can swivel flat to be stored against a wall or in a closet, or popped back into the carrying case and placed under a bed. Very handy for moving through doorways or tight spaces. What a great space-saving feature for a portable ballet barre! And…. we offer color options– Black, Gray or White aluminum. And the 4.5’ comes in Pink! Yes Pink! Don’t delay – contact us today to place your order in time for a PortaBarre to be delivered for Christmas! 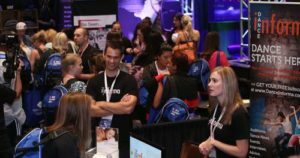 How many Dance Teacher Expo shows are you attending the rest of this year? EnPointe has several lined up and we are busy bees getting ourselves ready for exhibiting. EnPointe has been exhibiting at this show for many years and it is always a pleasure to attend. We see our wonderful customers, meet new customers, visit with our fellow vendors and of course catch up with Steve and Angela – our fabulous hosts. Vendors are always treated like Dance Teacher Show family and we love that! Please stop by our booth to chat and see our Glassless Mirrors – you won’t believe they are not glass! We will also have our ballet barres on show and check out our flooring samples. We are a one-stop-shop for dance studios. In 2015, DanceAttack expanded to Toronto, organizing the Toronto Dance Teacher Expo in which 600+ studio directors and teachers from all across Canada came together for an exciting and uplifting three days of instruction. This year promises to be bigger and better! We are so pleased to be attending and meeting new and current customers at the Expo. Please come to our booth to visit and say hi! Spring is literally just around the corner! Spring is literally just around the corner. Although for some of us, there is still snow on the ground. For others, flowers are just about blooming, but I’m sure you are all feeling that Spring in your dance step! 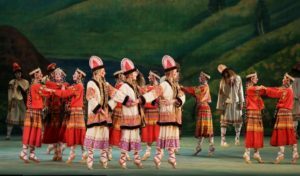 Of course, in the dance world we think of Igor Stravinsky’s astonishing ballet, The Rite of Spring, a ballet and orchestral work, written in 1913. The music and choreography were so avant-garde it caused a sensation and a near riot in the Théâtre des Champs-Élysées’ audience! 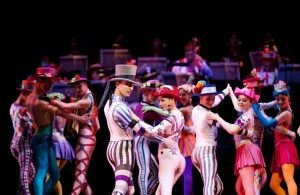 Erik Cavallari and Sophie Martin (centre) with Scottish Ballet in Kenneth MacMillan’s ‘Elite Syncopations’. Looking for Spring-like color inspiration for your ballet costumes? These dancers from the Shanghai Ballet, The Butterfly Lovers – Feast of Colors, were dressed to represent Spring’s lively birds and flowers. The crystals sparkled beautifully when the tutus and arm pieces quivered gently with the elegant movements of the dancers. Shanghai Ballet, The Butterfly Lovers – Feast of Colors – Spring! Speaking of Spring and Dance. If your classes are expanding and you need more barre space, remember that we have various sizes to choose from with our freestanding StudioBarres. We recommend, depending on the age of your dancers, about three feet per dancer. Our StudioBarres start at 4ft and go up to 20ft! EnPointe’s StudioBarre in Gray Aluminum with swivel feet. 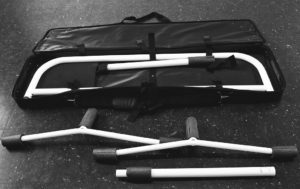 We can help with all your dance studio’s needs for wall mount, freestanding or portable barres with bags. We also carry glassless mirrors – wall mount or on rolling stands and have many types of flooring, including sprung sub-flooring, various vinyl dance flooring depending on your use and everything you need to maintain and clean your flooring. Let our experts guide you – we are happy to help! Remember to follow us on all the usual social media platforms for everything Dance related- Facebook, Instagram, Twitter and Pinterest .